Imprint Method: ColorPrint - 2 - Enjoy music on your patio, deck, at poolside, or in the yard with the Flower Pot Bluetooth Speaker. The Speaker is a flowerpot music system that contains one speaker and a Bluetooth receiver, allowing you to enjoy your music outdoors by streaming it directly from any Bluetooth device. The speaker will also play musical tones when you touch the plants growing in the pot. 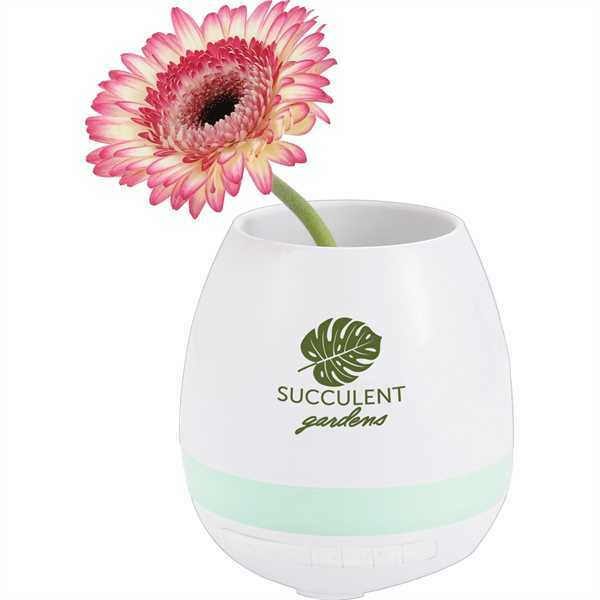 Enjoy your plants and your music at the same time: the Flower Pot Speaker is perfect for virtually any medium-sized plant. It even includes drainage. Its built-in speaker is housed in the base of the pot, ready to fill any outdoor area with music. Bluetooth working range is 10 meters. Includes Micro USB Charging Cable. 6hrs of playback time at max volume. Charging Time from 0 to 100%: 4hrs.